These are my top five favorite Public Golf Courses for Chicago. They are not in any particular order, but these are the top five public golf course choices. I have played each course at least once, and a few of them more than a few times. Great places to play golf, and you can sometimes find some great deals (check out the E-club for each course and sign up for the courses newsletter and you get some great deals direct from the clubs themselves). These are all public courses, so no membership is needed to play, but leave your cut off shorts in the car. Tom Fazio’s North Shore masterpiece, sits at the heart of a 195-acre refuge that features rolling terrain, dramatic elevation changes, tranquil lakes, meandering streams and stunning vistas, including the Chicago skyline in the distance. Course number 4 is the former, notoriously difficult home of the Western Open. Nicknamed “Dubsdread,” choose this course or number 2 when you go. This course has also sunk a bunch of big name awards, including being named to GolfWorld’s Readers’ Choice Top 50 Public Courses for 2009. Three nine-hole courses that fans report are all engaging and set in a lush 12-lake-2-creek setting. 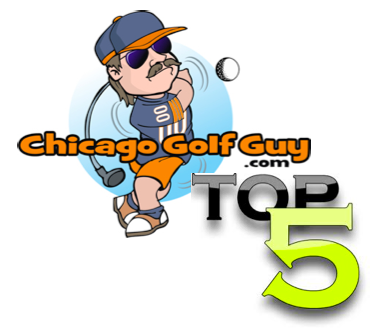 The Chicago Golf Guys Top 5 Public Courses in Chicago! The aim with Bio-Visual Focus is to not only show golfers how to get into the prpoer state of mind for each shot, but also to win. Bio-Visual Focus puts the golfer in full control of their state of mind. I think it would be cool if they could have the verification of your system to show them when they are there but the result of BVF are undeniable because BVF is mind and body rather than just mind. There’s no way Thunderhawk isn’t on my Top 5…I know it’s subjective – but for me, Thunderhawk is #1, ahead of Cog Hill for sure. And as much as I like the Glen Club, it is so clearly manufactured….Thunderhawk is a true golf course in a nature sanctuary.